In AutoCAD LT, the two default templates are acadlt.dwt and acadltiso.dwt. When you explicitly create a new drawing from within AutoCAD, the Select Template dialog box, appears by default so you can choose a template on which to base your new drawing. You may be familiar with Microsoft Word or Excel template files, and AutoCAD drawing templates work pretty much the same way because Autodesk stole the idea from them (encouraged, of course, by Microsoft, although one could argue that it was the other way around). A template is simply a drawing whose name ends in the letters DWT, which you use as the starting point for another drawing. When you create a new drawing from a template, AutoCAD makes a copy of the template file and opens the copy in a new window. The first time you save the file, you’re prompted for a new filename to save to; the original template file stays unchanged. Using a suitable template can save you time and worry because many of the setup options are already set correctly for you. You know the drawing will print correctly; you just have to worry about getting the geometry and text right. Of course, all this optimism assumes that the persons who set up the template knew what they were doing. The stock templates that come with AutoCAD are okay as a starting point, but you’ll want to modify them to suit your purposes or create your own from scratch. In particular, the stock AutoCAD templates are probably not set up for the scales you’ll want to use. So, the only problems with templates are creating good ones and then later finding the right one to use when you need it. The instructions here show you how to use an already-created template — say, one of the templates that comes with AutoCAD 2014 or one you get from a CAD-savvy colleague. Run the NEW command by pressing Ctrl+N or clicking the Application button and choosing New. The first button on the Quick Access toolbar runs the QNEW command instead of the ordinary NEW command. 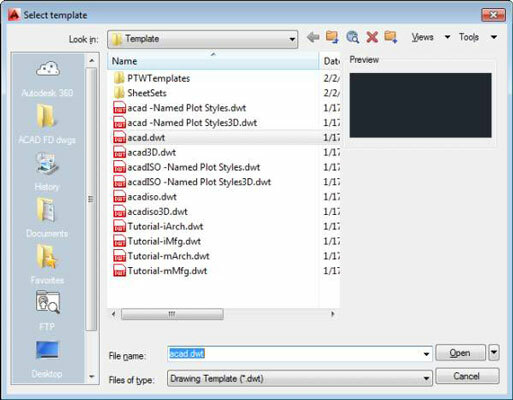 If you or someone else has changed the Default Template File Name for QNEW in the Options dialog box, QNEW will not open the Select Template dialog box; instead, it simply presents you with a new, blank drawing — possibly not the one you wanted. You can take advantage of QNEW, though. Click the name of the template you want to use as the starting point for your new drawing and then click the Open button. Depending on which template you choose, your new drawing may open in a paper space layout, not in model space. If that’s the case, click the Model button on the status bar before changing the settings. Press Ctrl+S or click the Application button and choose Save to save the file under a new name. Take the time to save the drawing to the appropriate name and location now. With most of the templates that come with AutoCAD, consider changing the units, limits, grid and snap settings, linetype scale, and dimension scale. If you’ll need other drawings in the future similar to the current one, consider saving your modified template as a template in its own right. A few of the remaining templates that come with AutoCAD include title blocks for various sizes of sheets. In addition, most templates come in two versions: one for people who use color-dependent plot styles and one for people who use named plot styles. You probably want the color-dependent versions.